The Royal Wedding: Our Coverage Plan And Key Times To Watch : The Two-Way Starting around 4 a.m. ET Friday, we'll be posting on what's happening before, during and after the ceremony. If you aren't near a TV or want a more discreet way to keep tabs on the wedding, please join us. 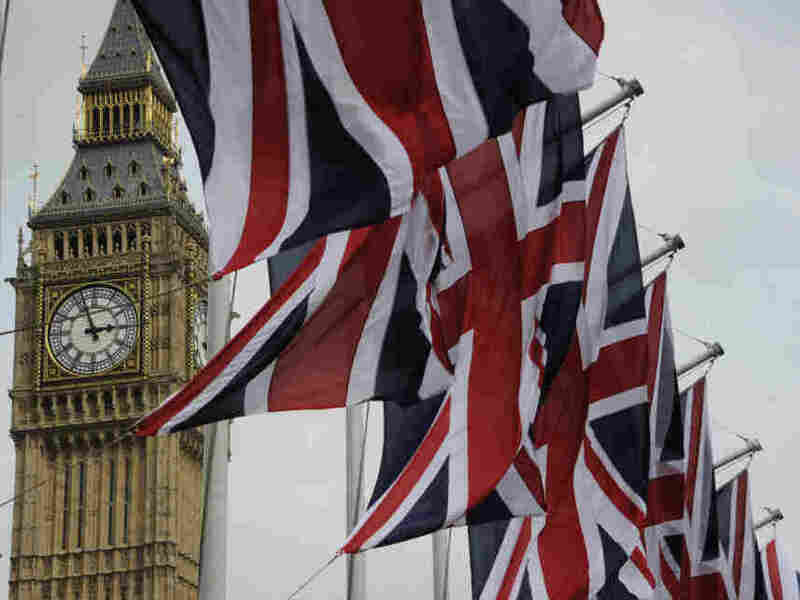 British Union Jack flags fluttered in the wind next to Big Ben, in London, on Thursday (April 28, 2011). On Friday, The Two-Way won't forget the other important stories of the day — from the devastating storms that have struck the South to the scheduled launch of space shuttle Endeavour in the afternoon. But with the British government predicting that 2 billion or so people around the world will tune in to watch, we know there's also huge interest in the wedding of Britain's Prince William to Kate Middleton. So, we'll be up early to follow the story. Starting around 4 a.m. ET, we'll be posting on what's happening before, during and after the ceremony. If you aren't near a TV or want a more discreet way to keep tabs on the wedding, please join us. We're also planning to draw in tweets from Monkey See's Linda Holmes, who is blogging from London. Now, as for when it's most important to be paying attention: there's a "royal wedding viewing guide" posted here. It has everything from when guests start arriving at Westminster Abbey (3:15 a.m. ET; 8:15 a.m. in London) to the start of a private reception at Buckingham Palace (1 p.m. ET; 6 p.m. in London). -- Around 5:45 a.m. ET: Queen Elizabeth and Prince Philip arrive at Westminster. -- Around 6 a.m. ET: Kate Middleton arrives; it should be the first glimpse we get of her dress. -- 6 a.m. to around 7 a.m. ET: The ceremony. -- Around 7:15 a.m. ET: The newlyweds leave Westminster. Will rain prevent them from riding in an open carriage? -- Around 8:25 a.m. ET: Prince William and Kate appear on the balcony of Buckingham Palace for their traditional "first kiss." We can't provide tea and scones, but we do hope you get a chance to check out our coverage.